Now that my Training Camp Travel & Evaluation time is complete, I want to take a similar spin-off of the Movement Evaluations that I have been doing during camp and perform 1 per week during the season of either current or even past players. However, these evaluations will be done with actual film analysis rather than through the lens of my naked eye as a player is moving live in front of me. This new style is much more accurate compared to the training camp fashion and is closer to how it is that I perform my movement analysis while I am working with a player. I thought it was only appropriate to begin the Player Evaluation series with a guy that I grew up fascinated with when I was a kid (as did many others in my generation). 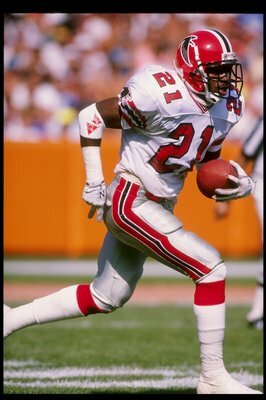 Though PrimeTime (or Neon Deion if you prefer) may arguably be the best defensive back of all time, he is often remembered by people for his unique persona both on and off the field. Nearly each day I tell my athletes at the beginning of their training sessions, “It’s time to go get the speed and the swag!” Well, Deion was essentially the definition of both of those when he was playing. Shoot; he still may be the definition of at least the swag portion yet today in his roles on NFL Network. 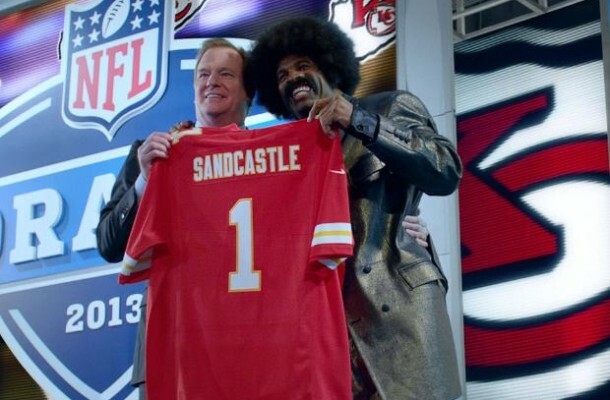 Only Leon Sandcastle could likely rival him in this area (OK; sorry…I had to use that reference at least once!). Before going any further, I actually want to give a quick shout-out to Deion for everything he is doing today on numerous fronts off the field and out of the limelight. First of all, many people still don’t realize how big of an impact he is currently making with his charter school, TRUTH. With this, he has dedicated himself to getting kids off of streets and into sports to help them learn life lessons and to take advantage of everything this life has given us. On a similar note, he consistently writes blogs that inspire and motivate thousands each month. His messages are ones that I look forward to and pass on for the power that they possess. 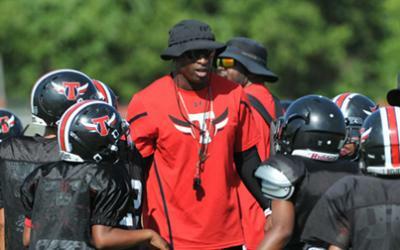 Check out Deionsanders21.com for more information and to read some of the things that he is up to these days. All in all, it’s obvious that his legacy will extend far beyond the football field and will impact people to greater walks of life than he did even on the gridiron. Unfortunately, Deion participated in the NFL Combine before it was the spectacle that it is today. Knowing the showman that he is, one can only fathom what he would’ve done at it had the whole thing been aired on a television network at that point. In addition, he also attended it when all drills were still hand-timed (making them much more variable/less accurate). Furthermore, he ran a 4.27 in the 40 at that event. However, if memory recalls me correctly, I once heard a story from an onlooker who claimed that he only completed one attempt at this drill and he may not have even warmed up for it. 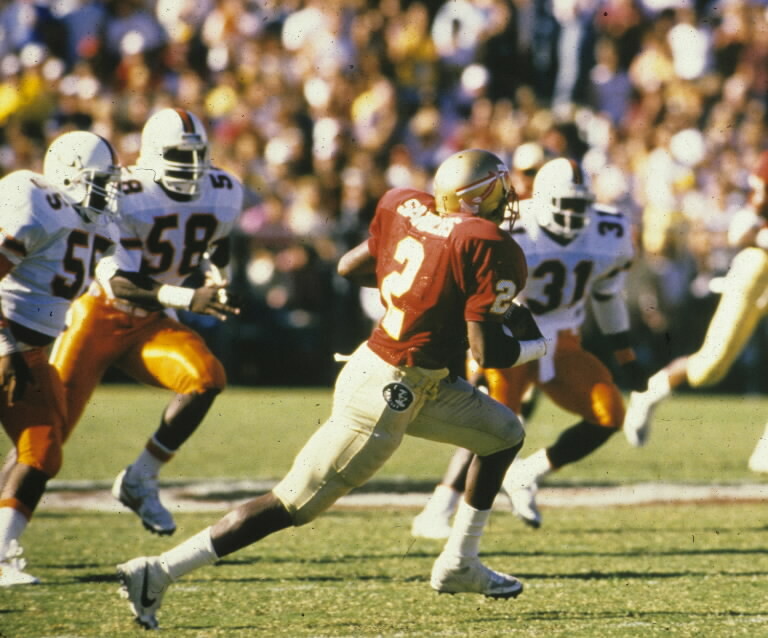 That said, Deion did run a 10.21 second 100 meter while at Florida State. AND…it’s worth noting that he was NOT a track & field athlete so it’s unlikely that he was trained in the tactical discipline of running the 100 (he played baseball at that time of the year). Thus, the boy was filthy fast no matter the sport task (I know – you don’t need my analysis to tell you that!). 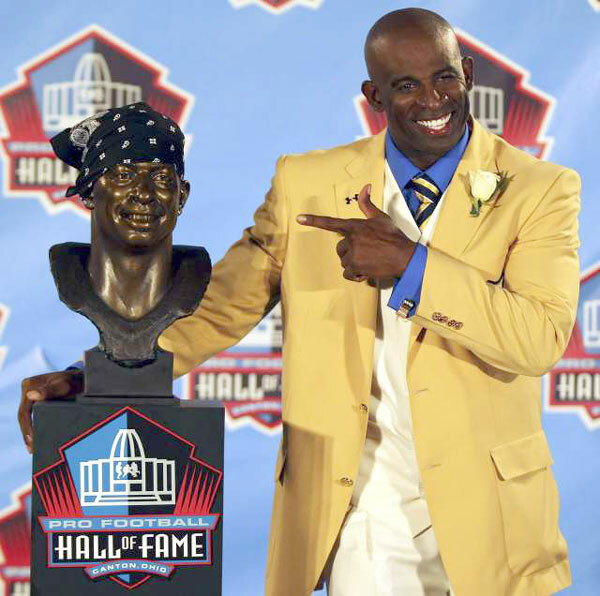 Among a long list of accolades, Deion is a member of both the Pro and College Football Hall of Fame, was an 8-time All-Pro, a 2-time Super Bowl Champion, an NFL Defensive Player of the Year, and holder of the most career defensive touchdowns. Anyone who watched him knows that he was moved all over the field and made an equal impact in whatever role and position he was asked to play. Obviously, the guy simply balled out. BUT…you know the question that I am here to answer…how did he move?! 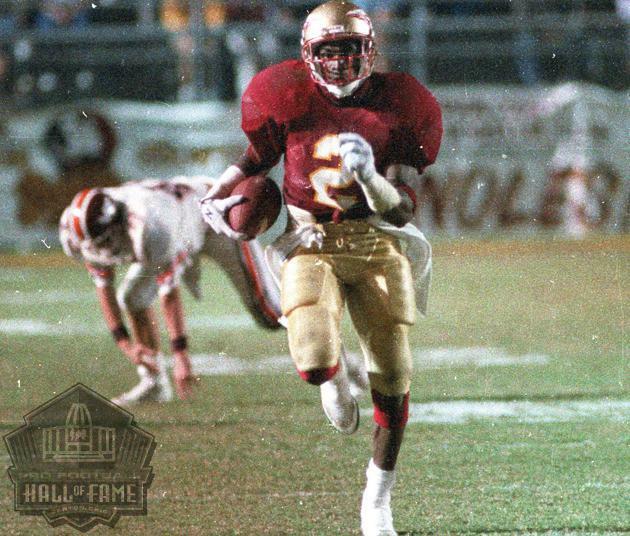 However, because Deion is no longer playing in the league, all of the film I was able to get my hands-on was nothing more than sporadic video clips that were usually highlights of him making plays (go figure; what else would be on a highlight video?). Granted, Deion was quite possibly the best big playmaker of his time so luckily there is an abundance of clips to evaluate to go around. However, when using various YouTube videos as my analysis tool it put me at a slight disadvantage as I wasn’t able to go frame-by-frame or pause on spots I needed to nearly as neatly as I would like to (but Rule 76; No excuses, play like a champion). With that said, let’s get rolling on my movement analysis so you can see what it is that I see when watching Prime do his thing! 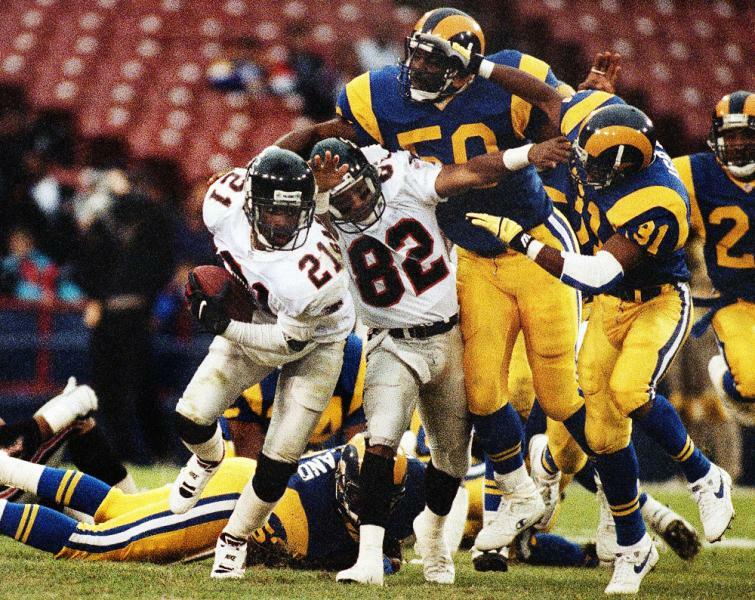 -Deion’s top end speed was a rare and special quality to watch even among players who have played all-time in the NFL. His closing speed allowed him to bait QBs into throwing balls that typically would be completed to their wide-outs but when 21 was lurking it would usually end up going the other way. -When running in a straight-line, he had a long stride but with quick, reactive ground contact response. These powerful steps/strides occurred anytime he was moving in a linear fashion (in both acceleration and at higher speeds). In my opinion, his gamespeed was actually much faster than the numbers would even suggest. This is instinctual and something I believe guys who crave the limelight possess over more reserved individuals. Look at the times when Sanders was matched up against the game’s best…I believe he was able to hit a different gear (like a sports car with nitrous oxide vs. without it). -Usually guys who are former track guys take a great deal of time to get up to their maximum speeds due to the nature of track events (hitting top speed at 40-55 meters) versus football competition movements (which require great acceleration in shorter distance and space). 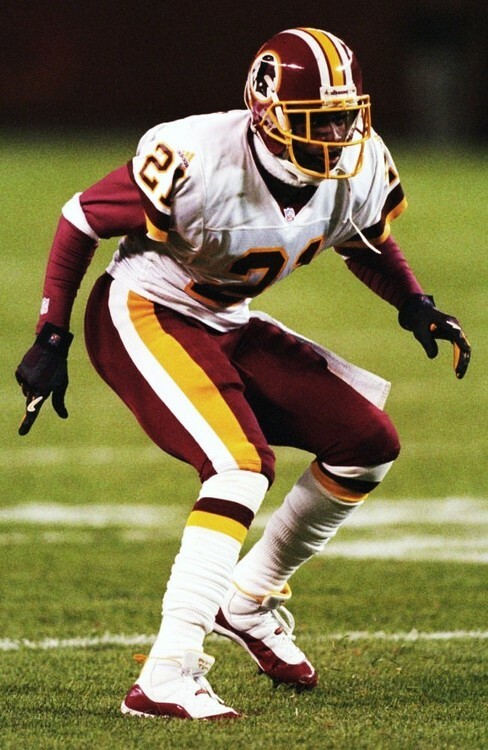 One of the things that made Deion so rare is that he had the unique ability to hit very high percentages of his top speed in mere steps. This made him very dangerous not only closing on balls thrown in front of him but also as scary as a return man because as guys were closing in on him, surrounding on top of him, he could often make a whole lotta something out of what appeared to be nothing. When I break this down much of this was an effect from him getting close to maximum extension at both his hip and his knee synergistically in the early steps of his accelerative patterns. This may sound intuitive as a necessity but in most guys in football movement rarely does this actually occur. -Typically many of the inefficiencies in linear speed on-field movement stem from the actions of the arms or torso/trunk action. However, Deion had very efficient arm action in that they usually were found very tight to his body and moved rapidly from shoulder to pocket with little wasted side-to-side action or over too far of range of motion. This helped him maintain steps/strides that were not only powerfully long but also rapid. The other thing that appeared to help considerably would have been the stability control of his trunk. You never would catch 21 swaying side-to-side or his core ‘breaking’ front-to-back in any movement pattern. 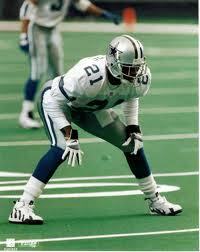 -Though he was often criticized for his tackling (what is there to tackle when you are shutting guys down though? ), when watching his tape you quickly see that he was very physical. In addition, when many corners get physical near the line of scrimmage or when running on a guy’s hip at higher speeds, any higher force bumping causes a guy to get off course or to become unstable and lose their balance. This was not the case with Prime. His proprioception and kinesthetic sense (i.e. how his body was positioned in space) was incredible. I know what you’re thinking… “Shawn, really? 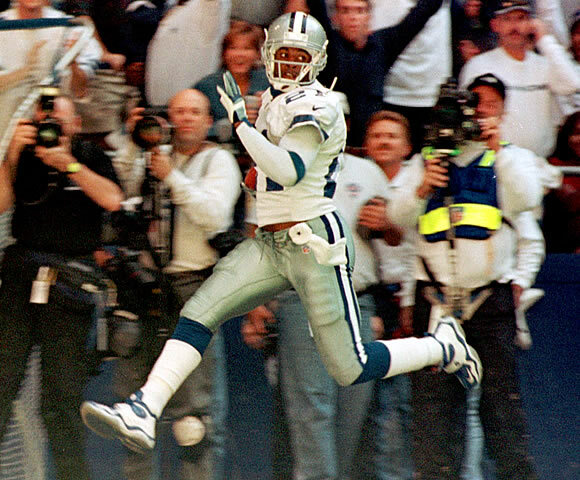 Deion…a weakness? C’mon man!” Even Deion himself would probably be giving me a “HOP” (Hold-on Playa) right now! But, every Superman has a kryptonite. Keep in mind that the majority of my job duties with my NFL players are to dissect their movement and find even the slightest weaknesses. I know that if we can change those it could be representative of the next step in their development and squeeze out every last bit of performance potential that they possess. -Deion had a tendency to remain pretty high in both deceleration and change of direction patterns. Some of this was likely based on the high height of his center-of-gravity (due especially to his long lower legs for his height) as well as the high speeds that he would typically be at when he was forced to react to a stimulus to stop on a dime or attempt to juke someone. Luckily, his superhuman-like ‘next gear’ enabled him to usually get through small gaps between opponents on the field when in these types of situations. Thus, when he did have the ball in his hands, he would usually come out of the fire relatively unscathed. -When he did have a ball in his hands and would be changing direction in the open field he would always utilize a lunge stop and reacceleration position or a crossover rather than squaring himself up or executing a sit-dip-drive power cutting action. This is usually a no-no for guys who are 6 feet and above because of the torque it puts on the knee. However, Deion was able to execute it with little energy leakage and I don’t believe he ever suffered any injuries that could’ve made this more problematic (so is it really a weakness?). -At times, in rapid changes in directional planes (like moving from a backpedal to a lateral reacceleration, etc) his last step before stopping and his first step into the next direction could’ve been worked on/cleaned up as there was occasional energy leakage and time wasting. Of course, his relative concentric force exertion (i.e. his gas pedal for his size) was extraordinary so it would be more difficult for his eccentric force absorption ability to truly match up. It would be even more difficult given the notion that nearly all training methods used at that time were of concentric emphasis. It was exacerbated further because once he put the GO pedal to the floor he was gone so he could get away with some inefficiency here. In addition, on the defensive side of the ball he was usually well-down the field still covering a guy so it’s not like he had to be overly proficient at his stopping actions in short space (for example; if he was playing in today’s game in a nickel role). -Lastly, in his CB-stance, he was often found in a little too awkward position for my liking. 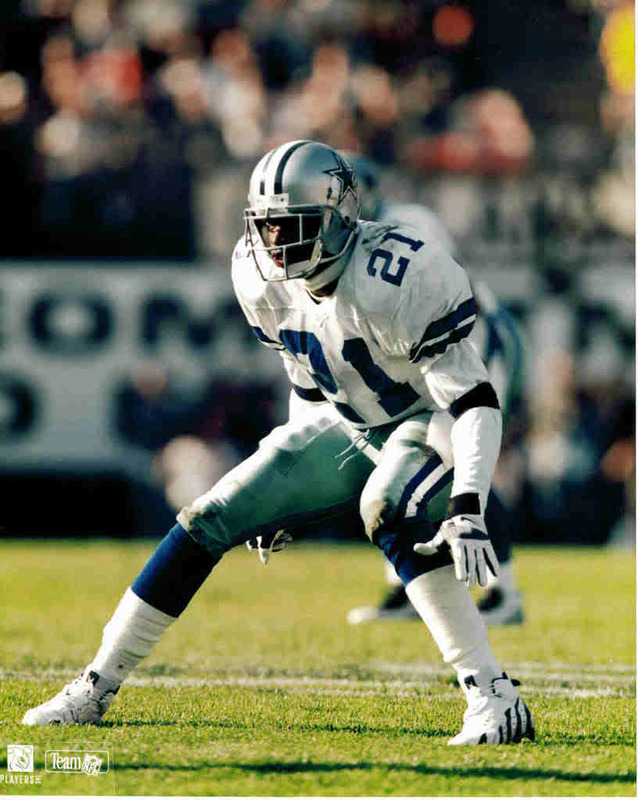 However, whereas most often guys show consistencies in their initial stance posture, Deion appeared to change it up frequently depending on what he was being asked to do tactically or strategically based on who he was playing and how he had decided he was going to man-up on the WR. All in all, how someone is starting will determine what type of position they will find themselves in the first step in any direction so this is an important movement trait to fine tune. However, even if he made a few inefficient or false steps early, he could easily make-up for it once his 2nd foot hit the ground because of his acceleration. Usually with my cornerbacks that play in the league, the majority of our time is spent on movement patterns that are common in and out of one’s backpedal. First, NFL corners are notorious for being overly lazy in their stance and backpedals and not being as deliberate as they should with not only their footwork but also their initial plant and acceleration steps in multiple directions. In addition, typical strength training means and methods don’t directly address the way that the body is positioned or displays force during this common movement action for corners. To complicate this further, many defensive backs (OK; typically corners) don’t enjoy strength training because they would rather get out and run something or someone down so they end up bored with most strength exercises. I believe this also happens because they don’t see the same type of transference from these exercises as some other positions do. Any training protocols that I would utilize with a guy of this level of mastery (display of the movement) and qualification (achievement) would be of special strength/movement orientation. What I mean by this is that it would have direct biomechanical and neuromuscular correspondence to what is happening on the field. Like I mentioned with the Tavon Austin analysis I did last week, my physical preparation philosophy dictates that there would be very little use of traditional heavy strength training or the speed training you typically see being done by most. These training modalities are way too general for an athlete with this level of specialization in his movement. Guys who possess these types of high-level speed qualities in movement tasks are more apt to regress rather than progress if the wrong training is incorporated. It’s actually just as easy to screw up an athlete of this level as it is to get them to improve. This is because of the nervous systems of these types of elite guys (i.e. they are wired much differently than the majority of athletes) as well as how specific/intensive the training stimuli must be in order to positively change them. I believe this is also why many NFL players end up actually becoming worse athletes once they have been in the league a year or two because S&C Coaches and sport professionals attempt to lump them into the same groups and training approaches as their peers when it should be clear that their level of mastery dictates that they are beyond this! Now, I have no idea if Deion used any training methods that would utilize what I would define as ‘specialized exercises.’ Honestly, I highly doubt it knowing that their use is still relatively uncommon among NFL players yet today. That said, even though he possessed world-class, on-field acceleration and top-end speed, I will be audacious enough to say that with the use of these types of training protocols geared towards his specific execution he would’ve actually been even more explosive. 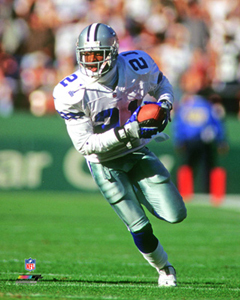 BEYOND THE STATS…I know this may give me the nickname Captain Obvious but Deion Sanders was an absolutely amazing athlete. He may be one of the very few NFL players whose level of movement mastery (he reached close to the highest level of his potential with his on-field movement) actually matches his level of qualification (he is arguably the best player at his position in the history of the sport). 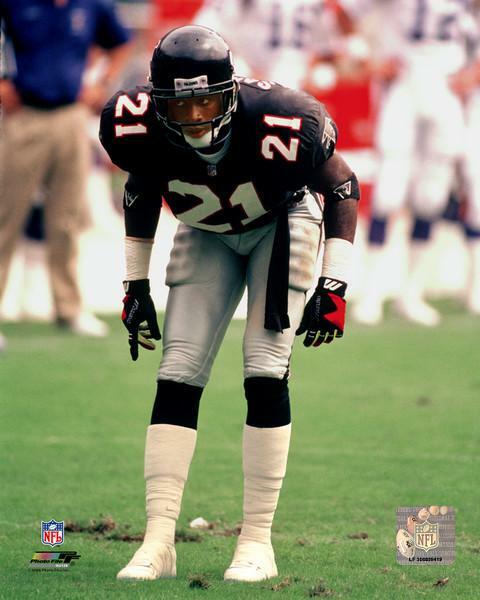 Deion’s one of the fastest guys to ever play football. If I were working with him, I’d get out of the way and let him do what he does best. Thanks for the comment. I hear ya. But…even the best can always get better. Just have to find the right areas to address and determine the most specific aim to train.